Sweet Potato Payasam is a deliciously thick and creamy milk based payasam, great for festive occasions. This incomparable mouthwatering Sweet Potato Payasam is loaded with nutrients and flavours. The high fiber content of sweet Potato makes it healthy and it is packed with Vitamin A and natural sugars and has low calories. Well, the natural sugars help to limit, but milkmaid and extra sugar will shoot up the calories, so there is only little respite ! Since they are good source of vitamins like Vitamin A and minerals like iron, potassium and magnesium, Sweet Potato helps to maintain a healthy immune system. 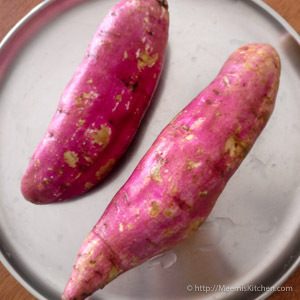 Sweet Potato has natural sugars and fibers, so, it is good for diabetic patients as well. You can boil sweet Potato and have it with spicy onion and green chilli chutney. Whole of Kerala is gearing up for Onam festival and Onam feast is never complete without sweet dessert / Payasam / Pradhaman. Onam sadya, the traditional vegetarian feast served during lunch on Thiruvonam day, has mouthwatering variety of vegetarian dishes served with rice, like Thoran, Erissery, Parippu curry, Aviyal, Sambar, Pachadi, kalan, Papad, pickles, crisps etc. and varieties of Payasams/ Kheer. Please do check my recipes for classic Palada Payasam, irresisitible Parippu Pradhaman and refreshing Pumpkin/ Mathanga Payasam. 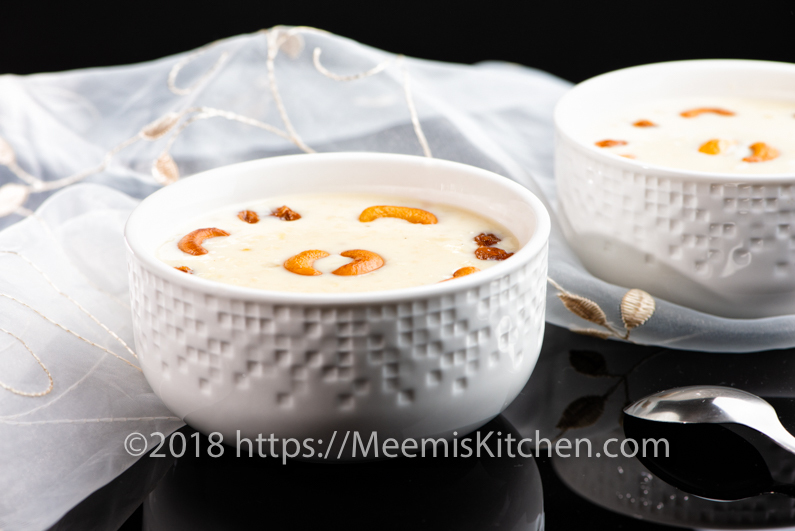 This year, my special Onam recipe for you is Sweet Potato Payasam or Madhura kizhangu Payasam. Sweet Potato Payasam is truly exceptional as the sweetness and flavours of Sweet Potato stands out and is delightfully refreshing. After preparing, we greatly enjoyed the warm and creamy Sweet Potato payasam with Sago pearls and had only little left, which I duly kept in refrigerator. Chilled sweet Potato Kheer was succulent, rich and you could make out the sweet, distinct flavours of Sweet Potato. Hope you all enjoy this tasty, elegant Sweet Potato Payasam for Sadya. Enjoy! Clean and peel the skin of Sweet Potato. Grate the sweet potato into thin strands. Boil the milk and keep aside. 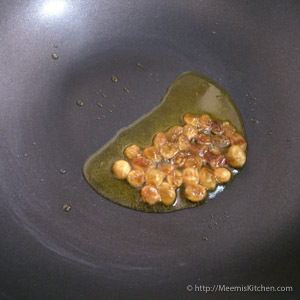 Heat ghee in a wide bottomed pan (I used non-stick pan) and fry the cashews and raisins and keep aside. 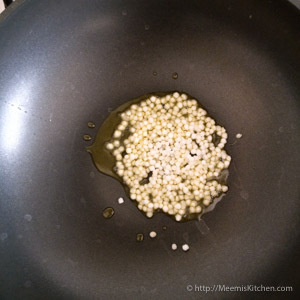 In the same ghee, toast the washed Sago for a minute. 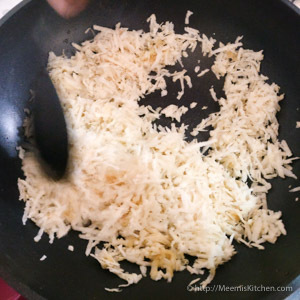 It will start changing color to opaque, then add the grated Sweet Potato to the pan and fry for 4- 5 minutes. Next, add 1 cup boiling water and cover and cook the sweet potato and Sago. 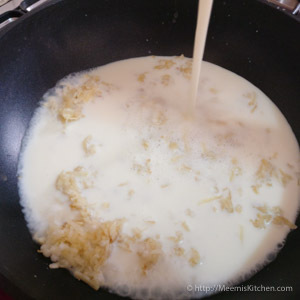 Next, add the hot milk and continue to mix well. 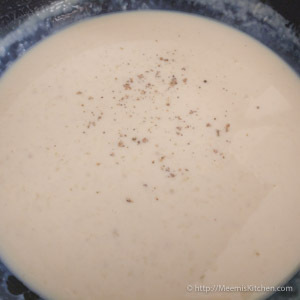 You need to stir continuously after adding milk to avoid cream layer formation. Let the milk and sweet potato combine well. 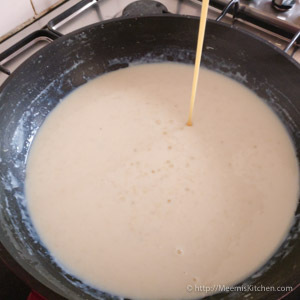 Once the payasam starts thickening, add half tin Condensed milk and continue stirring. Now, add 3 tbsp sugar (adjust to required sweetness), and mix well. Powder the cardamom and add to the Payasam and take it off the fire. Continue stirring for two three minutes. 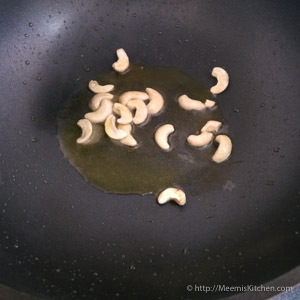 Garnish with fried cashews and raisins and serve warm. You may chill the payasam and serve, for more punch. It tastes good both ways. 1 medium sized sweet Potato is enough to make Payasam for 4-5 people. Adjust the sugar measure as per your sweetness level. Do not keep the sweet potato for long after grating. 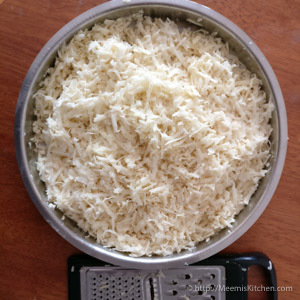 Toast in ghee immediately after grating for better results. You may soak sago for an hour if you like it softer. 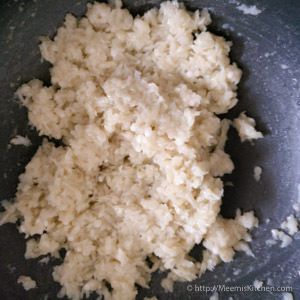 Only use very hot water to cook grated sweet Potato. The milk should be very hot while mixing with sweet potato. Half tin of condensed milk (Milk maid) is 200 gm. Hope you will try and enjoy this yummylicious Sweet Potato Payasam. Please put in your comments or share with your friends through the buttons on the side, as your feedback and comments are important and would motivate me to post more wonderful recipes. God Bless! !